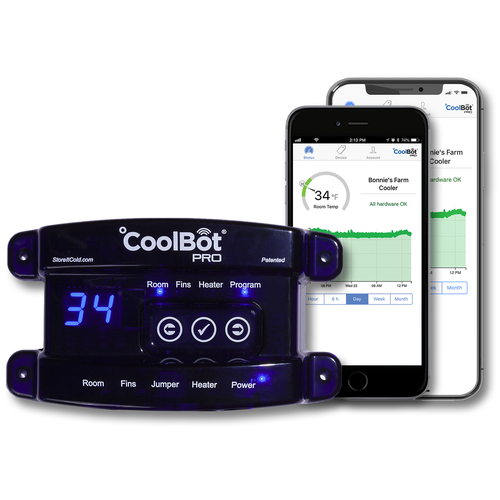 The CoolBot Pro brings you all the great features of the standard CoolBot with added WiFi connectivity, allowing you to monitor and control your cold room from your smartphone through the free mobile app. 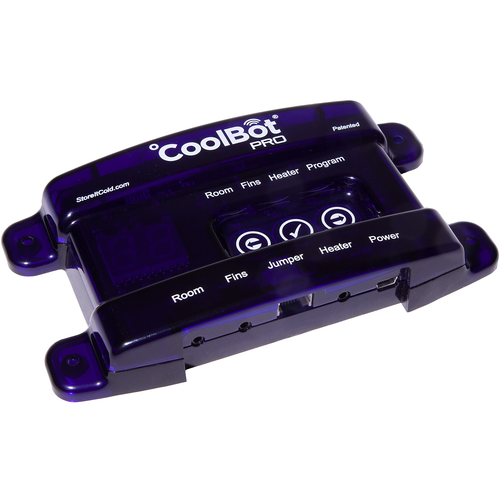 The CoolBot Pro enables a standard air conditioner to cool a room or space down to 34°F. Easily installs with no tools or electrical knowledge required. 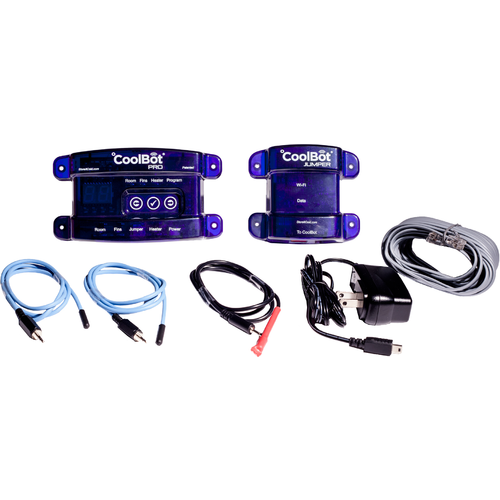 The CoolBot Pro comes paired with the Jumper WiFi relay module, which installs on the outside of your cold room. 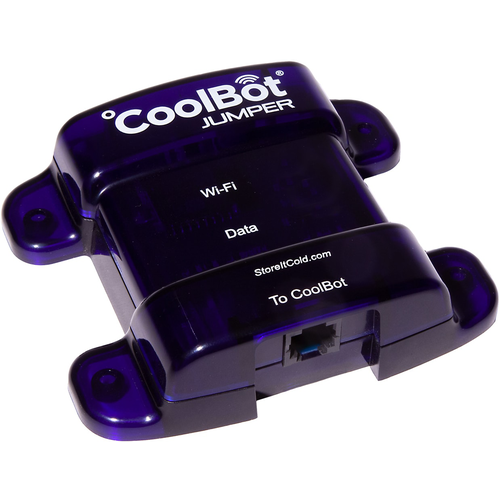 Once the jumper is connected to your wireless network, you can use the free mobile app to control your CoolBot from virtually anywhere with a WiFi connection. 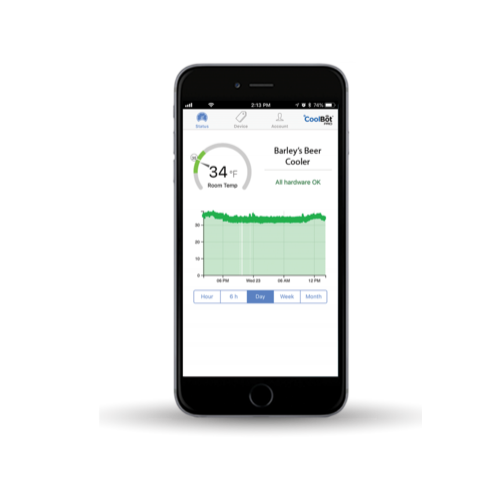 Monitor your cold room remotely, adjust temperatures on the fly, or program the app to send you notifications if something is amiss. 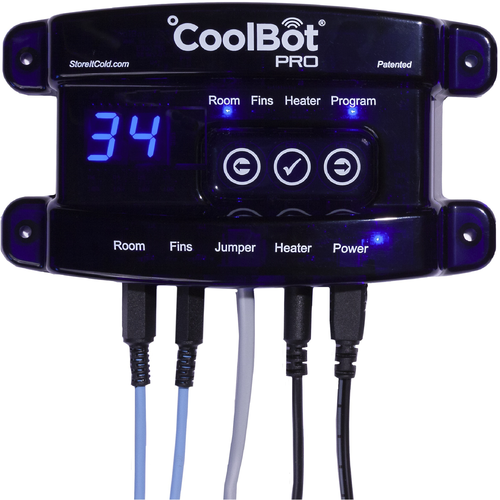 Whether you're on the go during a busy work week or taking some well-earned R&R, CoolBot Pro has your back! Standard A/C units available from any hardware or appliance store have lots of power, but they are electronically restricted to not go below 60°F. This is because they would freeze up. Commercial refrigeration for walk-in coolers combat freeze with increased surface area on the fins and fans. Instead the CoolBot technology uses multiple sensors, a heating element and programmed micro-controller to control your air conditioner in such a way that the unit can go below 60°F and not freeze up. The CoolBot cannot give you 100% of the BTUs listed on your air conditioner, nor is suitable for large brewery or winery walk-ins. But it is perfect for wine cellars, beer storage, fermentation, and many other applications. Easy to install within 30 minutes with no tools or electrical knowledge required. While we can't tell you exactly what size space you can cool because of ambient temperatures and insulation factors, we recommend you google CoolBot. They have sold over 50,000 of these so there are lots of reviews and actual installs out there. We offer free shipping on this unit, ship fast from both coasts, and have great customer service. This type of system is also very efficient. Most commercial systems are power hogs with large fans that are always running. Residential A/C units are made for efficiency. The CoolBot Pro will also shut down the compressor for a short time when the unit is running at its highest level of inefficiency, as it nears freeze up. Controller Dimensions: 6.5" x 3.4" x 1.1"
Jumper Dimensions: 4" x 3.6" x 1.1"
Please note: the instruction manual references a paid subscription for the mobile app. The mobile app is now offered for free, with no subscription required.